With everyone focusing on the death and suffering of the Palestinians, we have unfairly forgotten the plight of the Israeli citizens. But thankfully, God has blessed us with journalistic flag bearers such as the Washington Post, who have chosen to highlight the suffering of the 'other side'. Why are we being inundated with horrific body counts and gruesome images of Palestinians while the innocent citizens, such as the dear Mrs. Schwartz who was forced to cancel her Hanukkah party due to the threat of rocket attacks, are being ignored?? "She had planned a Hanukkah party on Saturday for the children in the kibbutz. But the Israeli military issued an order for all residents to stay inside their homes. So she had to cancel the party. "I feel bad. You have to explain to the kids why you can't live a normal life," she said. "Every day I walk five kilometers around the kibbutz," she added. "Today, I didn't. I was scared."" God bless the Washington Post for having the guts to publish her grueling side of the story. Where is the humanity when a 48-yr old mother of four is forced to cancel her daily 5-km walk???? "Schwartz pointed at a crater from a rocket that landed near the kibbutz's office and tore a hole in the sidewalk." How can the citizens of Israel be expected to walk on the streets with holes riddling their sidewalks?? How inhumane! "Langere lamented as he sat outside his white house looking at the weeds and mud patches in the communal area. "It used to be very nice. Now, it is a catastrophe. Now, you see no grass, no birds."" No grass? No birds? Such a "catastrophe" must not go unpunished! "From here, we send a blessing to the Israeli government and the soldiers to strengthen themselves and continue what they are doing to bring peace in the area so that we can go back to our lives," the city's mayor, Yehiel Zohar,"
Preach Mayor! May God give them the strength to ensure that the grass and the birds returns and Mrs. Schwartz can resume her daily walks. "But today's horrific attacks mark only a change in Israel's method of killing Palestinians recently. In recent months they died mostly silent deaths, the elderly and sick especially, deprived of food and necessary medicine by the two year-old Israeli blockade calculated and intended to cause suffering and deprivation to 1.5 million Palestinians, the vast majority refugees and children, caged into the Gaza Strip. In Gaza, Palestinians died silently, for want of basic medications: insulin, cancer treatment, products for dialysis prohibited from reaching them by Israel." "Under an Israeli-style truce, Palestinians have the right to remain silent while Israel starves them, kills them and continues to violently colonize their land." In reality, Israel has never wanted real peace. Their existence is based on a perpetual state of conflict. That's why whenever a ceasefire or a lull in the tension lasts too long, they'll agitate the Palestinians by carrying out an assassination of a local leader or some other unprovoked act of stupidity. The political entity of Israel needs to justify its settlement expansions, oppressive policies, tight control of borders, and so on all in the name of security - and that can only be accomplished with a backdrop of violence and mayhem. Frustration is abound all over. Let us all focus our energies back to our Creator and pray for His Mercy to descend on those who wish for nothing but a peaceful life in which they can worship Him properly. I've written on this before (here and here), but its worth repeating over and over again: American-style consumerism is a dangerous virus that is dragging the entire world down with them. The current financial crisis is merely the latest manifestation of the sickness. This article sums up the dilemma quite well - the pursuit of happiness has been replaced with the pursuit of comfort, the comfort supplied by gadgets and goods. It's very interesting how he compares the Hajj stampedes to the recent stampede at Wal-Mart that killed one and injured several others. The religion of consumerism is no different than other religions, even celebrating its very own holidays (Black Friday). One noteworthy difference is that extremism is much more rampant in the religion of the free market than other traditional religions. "A consumer economy only works if consumption of goods provides only temporary pleasure. That is, if happiness is infinitely deferred, so that buyers continue to buy more and more goods and services. By definition, the consumer can never be satisfied, at rest or happy. Which means she will always feel lacking. The pursuit of this sort of happiness creates a vicious circle of growing anxiety and dissatisfaction." "We are like the 30-something characters in Seinfeld, who know they are immature, who know they are avoiding the responsibility of building meaningful relationships and of leading meaningful lives - and who don't really care." "Anything happens in the village the whole village will gather to watch. Seriously. They have no life, poor people"
That overly simple life that some may look down upon is no worse than the exciting, happening life we are mired in. 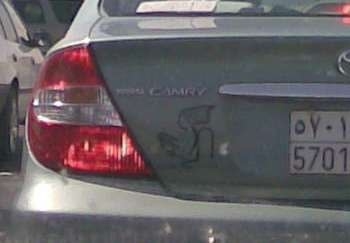 This is truly genius. How come no one has ever pointed this out to me before? In fact, from now on I'm travelling with a matchbox as a kind courtesy to my lovely hosts. And yes, I *am* a very thoughtful guy, thank you very much. So how about everyone jump on board this train before it passes them by and begin placing matchboxes in their bathrooms? As for you desis who insist on cooking with lots of ghee and curry spices, how about placing TWO boxes under your ceramic thrones, mmkay? Or better yet, how about those emergency flare thingies...some of you brothaz could definitely benefit from those bad boys. Or maybe a flare gun. OK, I'm getting carried away, I'll end now. "I am the very last President not to really have to worry about YouTube" while campaigning for the White House, President Bush told RealClearPolitics in an exclusive Oval Office interview last week,..."The 'gotcha' moments in my campaign in the past were few and far between," the President recalled, noting that with the advent of YouTube candidates have to be "really careful" what they say or "you're liable to see yourself on the Internet, along with 20 million other people." Thank God there aren't any YouTube vids featuring any of your 'gotcha' moments. Yeah, you really lucked out there buddy! "The country stands before a "moment of change in people's attitudes and thinking" toward militants, Sen. John Kerry said Tuesday in Islamabad. Pakistan must see that Lashkar-e-Taiba has "morphed into a more al-Qaida-esque and radicalized entity" that is damaging the country's interests, said Kerry, incoming chairman of the powerful Senate Foreign Relations Committee." He went on to denounce Pakistan for its role in creating the militant group Lashkar-e-Taiba, calling on the nation to cease using militant groups as foreign policy tools. And to think, he was able to say it with a straight face, fully cognizant of the US role in supporting shadowy militant proxies the world over. Al-Qaida-esque, you say? I wonder who was the prime supporter of *that* militant group in the 80's? When will the US stop trekking all over the world, lecturing the natives against practices longtime established in their own foreign policies? 3. I never got around to commenting on this when it was in the headlines, but did you all laugh as much as I did when reading about the CEOs of the Big Three (GM, Ford, Chrysler) pledging to work for $1 a year??! What a bunch of phony insincere rascals! I wonder how many of the public were duped by this 'magnanimous' gesture? While they may cut their annual salary down to $1, they'll be sure to cash in with their stock options, bonuses, and special executive incentives. Check out this Slate article exposing these criminals. Although it was written back in 2003 about the dot com CEOs, the same con game lives on in 2008. 4. Did you all pick up on the game of semantics being played with the withdrawal of American forces from Iraq? In order to maintain his campaign promise of withdrawing all US forces within 16 months, Obama and his administration are creating a difference between 'combat' troops and 'support' troops. So any troops that will remain in Iraq after 16 months will cease to be combat troops - they'll magically transform into 'support' troops - sorta like those AA (Alcoholics Anonymous) support groups where they all sit in circles and talk about their difficulties. Not even president yet and you're already breaking campaign promises. Real smooth Obama...real smooth. Read it so often that when a friend calls you up out of the blue and asks you when was the last time you read the Quran, your answer doesn't embarrass you. "It's much easier to loot a country when it has a destabilized government and various warring factions. You don't have to deal with one central government - you can deal with whatever warlord is controlling whatever diamond or gold mine you're trying to exploit." That's exactly what I wrote in a previous post where I detailed the roots of the war in Congo. BTW, be sure to bookmark the Real News Network. They've got amazing news reports with perspectives you'll never find in the MSM. Here's a new blog that I found has some interesting views: A Thinking Muslim. While I may disagree with much he says, I think its always important to maintain a dialogue with those who hold contrasting views. Marc writes an interesting post calling out those amongst us who are constantly criticizing the Muslim community for its lack of manhood (as narrowly defined by them). While I can empathize with those calling for Muslim men to start acting more like men, Marc does make a valid point that the Ummah clearly has room for variations in the way we we implement 'manhood'. Sr. Sidra at Healing Heart has a nice post featuring a tafseer of sorts on the famous song "Row, row, row your boat". Very interesting Islamic spin on this childhood favorite. Here is an amazingly on-point article discussing the top 3 reasons why marriages fail for men. His first point is so absolutely true - I don't even know what his other two points were. It's ALL about the nafs people. As he mentioned in the article, you MUST lay down your nafs to let it get stepped on by your wife. I just can't imagine that a loving relationship is possible without that element of forced humility. BTW, I don't think this applies to most women, since by their very nature, they are always giving in and sacrificing for the good of the family. *Check out this site for more cool Holophonic sounds. 1. The US is trying to push through a UN resolution allowing any nation fighting piracy to "take all necessary measures ashore in Somalia, including in its airspace". This would make Somalia officially a no-holds-barred, full-time war zone - as if it wasn't already. 2. BBC is reporting that more than 80% of Somalia's forces (almost 15,000 officers and soldiers) have deserted their posts and almost 70% of the funding for the government's security budget has disappeared amidst major corruption. 3. And in the weirdest twist of all, according to CNN more than a dozen Somali-American youth have returned to their home of origin to take part in the war. Although their plans are shrouded in mystery, they were most likely convinced to go back and partake in the jihad on the side of the Islamic Courts against the warlords and the Ethiopian occupiers. Not sure what to make of this last bit of news. While I fully support the struggle of the Islamic Courts in trying to bring a semblance of peace and security to their war-torn nation, I'm not sure it's the wisest of tactics for American youth to go there to fight. Their energy and exuberance could have been channeled so much more productively if they had stayed in the US and actively participated in their local communities. Surely there is no dearth of work on the local front. But on the other hand, I can see where that logic may lead us down the slippery slope of lazily justifying our lethargy when it comes to taking action. After all, if Somalia is not a proper arena for real Jihad against oppression and injustice, then what is? What happened to the days when armies were mobilized from one side of the Muslim world in order to redress an injustice carried out on the other side of the Muslim world? In these confusing times, may Allah (swt) guide us all to what is best! 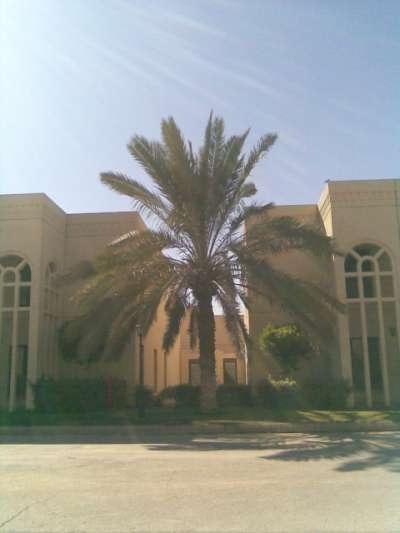 I am very much enamored by the palm tree as there is so much to learn from it. The little amount of water that it needs to subsist is an important lesson for all of us, in this day and age of extreme consumption. Additionally, I've seen enormous palm trees being transported on the back of large 18-wheeler trucks, revealing how their roots never go too deep into the soil - teaching us to also never entrench ourselves too deep into this world. 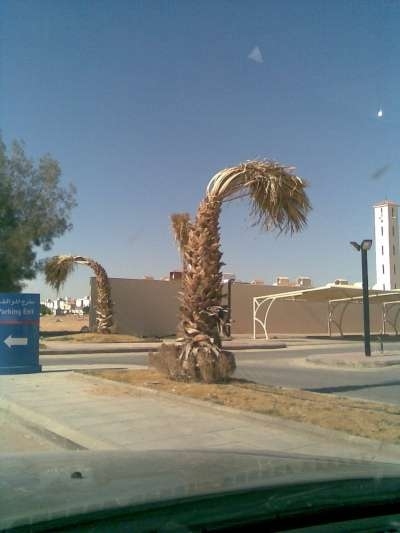 But most amazing of all is the way the palm tree dies. Oh, how I wish to die in a similar state! 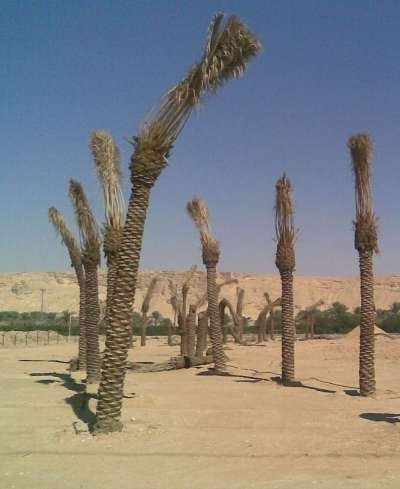 When they die, most other trees remain erect and upright. 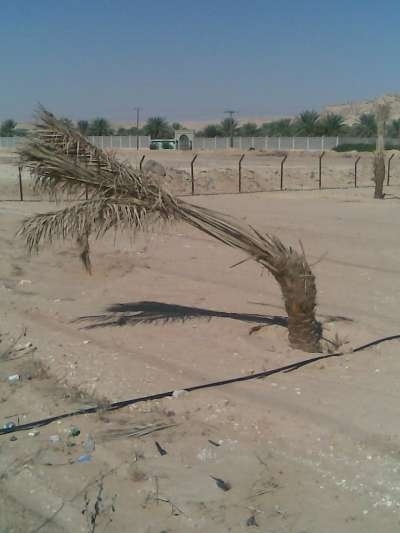 However, I was truly taken aback when I saw how the palm tree dies in a form of bowing or even prostration. I pray I am able to meet my Lord in such a state of submission. 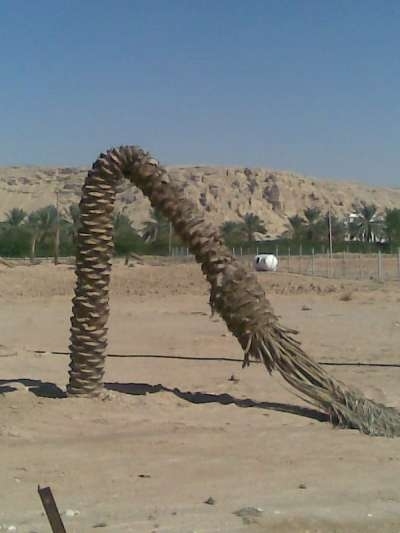 A palm tree graveyard - notice the trees in the background, bowing and prostrating. Let us strive to live in a state of dhikr so we can die in a state of dhikr! We all know the history of the CIA in Afghanistan during the 80's. We all know how they trained, funded, and armed the Afghan mujahideen against the Russian occupiers. We all know how America had little humanitarian concern for the Afghan well-being, but rather used them as pawns in the Cold War. So does it surprise us when we look at Darfur as another playing field in this on-going war of international politics. The venue has shifted and the enemy is different, but the game is the same. Instead of Afghanistan, it's now Sudan. Instead of Russia, it's now China. Instead of America, it's...oh wait...that's the same. You see, while Sudan may not mean so much to America, it's a major business partner with China. This pesky relationship is built on massive infrastructure construction projects, huge military contracts, and of course oil. China is eyeing Sudan as a primary source of energy to source its economic growth. That being said, is it beyond the scope of reason that the rebel groups (Sudan Liberation Army, Justice and Equality Movement*, and others) are being instigated by outside forces for the purpose of destabilizing Sudan. Has not America supported 'rebel groups' across Central America and South America in the past, turning a blind eye to the ensuing devastation, so long as her own interests were served? Why would Darfur be any different? With the continuing genocide taking place in Darfur, the UN has attempted a handful of times to enact economic sanctions, with China calling upon its veto power to ensure the sanctions remain only on paper. After all, a Sudan handcuffed by economic sanctions would be a crippling blow to China. I alluded to a similar strategy taking place in DR Congo, where outside forces are undoubtedly playing a major role in sustaining an atmosphere of instability. Only difference being that while DR Congo is a financially-motivated war (reaping the profits from subterranean natural resources), the Darfur crisis is a geopolitically-motivated war (hamstringing the growing Chinese threat). I'm not defending any of the atrocities carried out in Sudan nor am I absolving China for their role in arming the Sudanese government. I'm simply saying there is much more to this crisis than many care to know. It's so much easier to create a good-v-evil campaign with Sudan and China playing the bad guys and George Clooney and America playing the good guys. But the reality is never so black and white. So let's stop with the overly simplistic presentation of the Darfur crisis as some ragtag rebels and freedom fighters versus evil 'Arab' Janjaweed militias and the Sudanese government, and let's look at it with a more critical eye, focusing on political interests and international alliances. *It's worth noting that the rebel group JEM has attacked multiple China-run oil facilities in Sudan in recent years. The nominations for this years Brass Crescent Awards are out...do check them out. Fittingly, yours truly is not among the finalists, as it's simply not possible to categorize my astounding writing skills. Just not possible folks. But I will go out on a ledge here and categorically declare that if there existed a category for best Muslim blog by an American-Muslim of Pakistani descent, living in Riyadh, with wife and three kids, one named Humza - I would most definitely win. Dissident Voice has a nice article about the recent controversy surrounding Chomsky and Zinn supporting a vote for Obama. Check it out people. The writer ends the article with these strong words: "A vote for either John McCain or Barack Obama is—at best—an act of criminal negligence." I see this as a perfect analogy representing the choice being made by anyone deciding between the two candidates. Obama supporters are essentially saying that pulling the knife out six inches is the best we can do. I say we leave the knife all the way in until the poor sap figures out how to fight back. *That’s* the change we need! A commenter on my previous post asked what alternative solutions do I propose (instead of voting Obama) and I responded that third party alternatives exist, as well as countless other grassroots organizations that are struggling for real change. I find it truly objectionable when people respond that a vote for any third party candidate is a wasted vote. Why have we accepted this predicament where only two parties are representative of the broad spectrum of the American people? Isn't that the real question? We're accepting defeat when we allow the debate to be framed between these two parties. They do NOT represent all the varying views that exist. We need to step outside the preset parameters of the Repub-Dem debate. Its not about Obama versus McCain. Its about the masses versus the elite. Educate yourself with this debate between presidential candidates, Ralph Nader and Chuck Baldwin. Although I don't necessarily agree on all the issues with these candidates, I stand behind any and every attempt at busting the two-party mafia that runs America. The real shame is that most people will never watch this debate. They need 30-sec soundbites or else their ADD kicks in. The Lesser of Two Evils?? I’ve posted before on the hollowness of Obama and his campaign for ‘change’. Pigs will fly before he confronts the three-headed dragon of racism, materialism, and militarism that has wreaked havoc across the American landscape. However, in this post I wanted to focus on another argument peddled by Muslims supporting Obama – namely, he’s the lesser of two evils. Sorry folks, but that is such a defeatist attitude. Instead of arguing about the need to change the crooked system that insanely refers to itself as a democracy and claims to stand for freedom and justice, American Muslims are justifying participation with this weak-minded logic of ‘lesser of two evils’. Muslims must stand for their principles, as exemplified by our most perfect teacher (saw). Have we forgotten how the Prophet (saw) rejected participation in the crooked Meccan political system? Did he not out-rightly reject their power-sharing deal, later responding with the famous words: Even if they (Quraish leaders of Mecca) were to place the sun in my right hand and the moon in my left, I will never join them nor will I ever desist from my message? Then how come we are so quick to partake in an American political system that puts to shame the shenanigans of the Meccans? I’m not arguing whether its halal or haram to partake in the political process. I’m simply talking about good ‘ol common sense. Listen, even if the Prophet (saw) himself were standing for the President of the US, I wouldn’t vote for him. No one man can ever make a difference from within a crooked system. The Prophet understood that and that’s why he rejected participation. His struggle was to replace the rotten core - lock, stock, and barrel, instead of trying to reform it from within. Those Muslims who are intent on exercising their right to vote by choosing the lesser of two evils would be better off focusing their energies on exposing this corporatocracy, as John Perkins of ‘Confessions of an Economic Hitman’-fame so aptly refers to it. Simply choosing to ‘live in dignity’ as an American Muslim is burying your head in the sand ostrich-style. Simply declaring that we are ‘free’ to worship our Lord is not sufficient. Simply washing our hands of the crimes perpetrated by our adopted homeland is not sufficient. I’m not calling for the shariah. I’m merely calling for basic justice. The truth of the matter is that justice will be never be implemented by the current system of governance in the US. The powers-that-be will never allow for true justice to prevail. True justice has a price tag they are not willing to pay and requires a sacrifice they are not willing to make. This is about decades of underhanded oppression that have strangled the peoples of South America, Africa, and Asia. This is about pushing consumerism to the max, ignoring all social, economical, and environmental ramifications. This is about supporting (and even installing) despotic regimes all over the world. This is about the economical hamstringing of the entire Third World by the G8 countries (ingeniously using the IMF and World Bank). This is about supporting anti-democratic forces against the democratically elected governments of Bolivia, Palestine, and Venezuela (to name a few). This is about the cancerous banking system that has spread all over the world. This is about a military-industry juggernaut that has wreaked global chaos with power and greed fuelling its ambitions. This is about continuously expanding the gulf between the haves and the have-nots, within America and throughout the world. Confronting and ending these injustices is the change we REALLY need. And sadly, all we American Muslims are concerned with is our ability to build Islamic schools, freely attend the local masjid, wear the hijab unharassed, and vote for Obama. Fine, ignore the real struggle. Go ahead and claim that you’re doing your part by voting for the lesser of two evils - Just lemme know how the sand tastes down there. If I had to create a list of the greatest blessings of being married, this would most definitely be in the top five. You see, we have these little baby blankets all over the house – perfect snuggle blankets – very soft and just the perfect size. And me being the master-napper, I’m the ideal recipient of these blankets during my post-work siesta. So when my wife comes over and spreads the blanket and tucks me in, just as I’m gently floating into my glossy dream world, I can honestly say I’ve tasted heaven on earth. But recently that rarely ever happens. ‘Cause after 15 years of marriage, I’m happy if she simply throws me the folded-up blanket from across the room. So for you young couples out there, this is an easy way to get brownie points with your slumbering spouses. And for you older ones, just try and aim for the feet when you throw the blanket. We nappers would be much obliged! We’re always reading about reporters embedding with the US forces or the coalition forces, but here’s a piece of real journalism where the reporter is embedded with the Taliban. These fighters may spend most of their time praying in the masjid (as mentioned in the article), but they have no problem turning around and killing each other over differences in religious interpretation. How very typical of this Ummah. When it’s all said and done and the US negotiates a face-saving withdrawal (involving both the Afghan government and the Taliban), I fear the end result of this latest episode in Afghanistan will be the same in-fighting that erupted when the Russians were expelled in the 90’s. But instead of greedy warlords aspiring for power, it will be jihadi zealots claiming religious authority over each other. That’s what you get when hearts are not transformed, choosing instead to force change from the outside in. "More troops are not the answer," a senior United Nations official in Kabul tells me. "You will not make more babies by having many guys screw the same woman." My good friend Marc at his Manrilla blog mentioned in a recent post the story of a third generation American Muslim who has basically left Islam. While the grandfather remains a practicing Muslim, the parents are more or less lax in their adherence and so the college-age grandchild has taken on the predominant American attitude towards religion – indifference. And that, folks, is one of my greatest worries in raising children in the West – that lack of ‘secondary and tertiary enforcements’ that are readily available in Muslim countries. 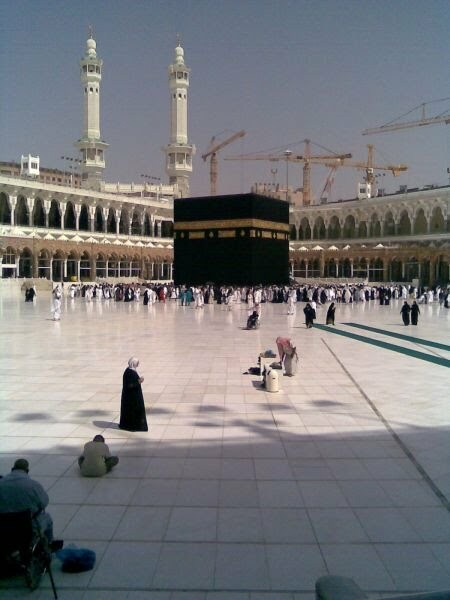 From the adhan heard throughout the day to the social pressures against the hard sins (drinking, fornicating, etc.) to the ease in donning Islamic clothing to the non-issue of praying in public, I feel many Western Muslims are overlooking the importance of these peripheral factors. By themselves, I admit, they are relatively insignificant. But in the larger context of creating an Islamic persona, their significance cannot be emphasized enough. Particularly when the primary enforcements (ie. parents) are lethargic (or maybe even ineffective) in their efforts to impart an Islamic ethos to the child. Does such apathy towards religion exist in the Muslim world? Of course. But as of yet (and it may change), it’s not socially acceptable and definitely not celebrated. An atheist or an agnostic in the Muslim world would have to stay ‘in the closet’ or suffer social ostracization. Freedom of religion be damned. It wouldn’t surprise me if the grandchild (or even the child) of the student cited above would one day openly renounce Islam and convert to another religion. Regardless of how un-Islamic Muslim society has become, what are the chances of that ever happening in a Muslim country?